Janie's Pocono Mountain Garden: Let's Talk Turkey - In The Wild & In The Supermarket! Let's Talk Turkey - In The Wild & In The Supermarket! Folks, Can you believe it! Another Thanksgiving is upon us. 1. They are the largest game birds found in North America. 2. They are intelligent, social, and have excellent eyesight and hearing. 3. wild turkeys can fly short distances up to 55 mph. 4. They can run up to speeds of 35 mph. 5. 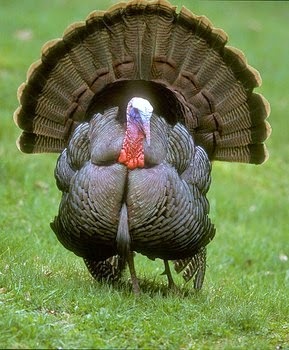 Only male turkeys, called Toms, can gobble. 6. When a Tom gobbles, the sound can be heard up to a half a mile away. 7. On average, their lifespan is 4-5 years in the wild, sometimes as long as 10. 8. Wild turkeys have between 5000-6000 feathers. The male's feathers are more colorful with areas of red, purple, green, brown, bronze, and gold. Its 18 beautiful long tail feathers, called a fan, are proudly displayed during breeding season to attract a female. Trivia: If Ben Franklin had his way, the North American wild turkey would have been the national symbol of the United States ... not the American bald eagle. He felt that the bald eagle was a creature of "bad moral character." Trivia: There is some controversy concerning the claim that the Pilgrims hosted the First Thanksgiving in the New World in the Fall of 1621. There is speculation that in 1598 a Spanish explorer had led an expedition of 500 people across southern Mexico finally reaching the banks of the Rio Grande near San Elizario, Texas. In "thanksgiving" for their survival on their long, arduous journey, they held a mass and feasted on local game and fish from the region. Folks, pictured below are the turkeys that will wind up on your dinner table for Thanksgiving. They are commercially raised domesticated white turkeys. 1. They, too, are intelligent and social. Their vision and hearing is just not as developed as their wild cousins. 2. They cannot fly. Because they are bred to have larger breasts and thighs, they are much heavier than their wild cousins. They weigh, on average, twice as much as wild turkeys. 3. 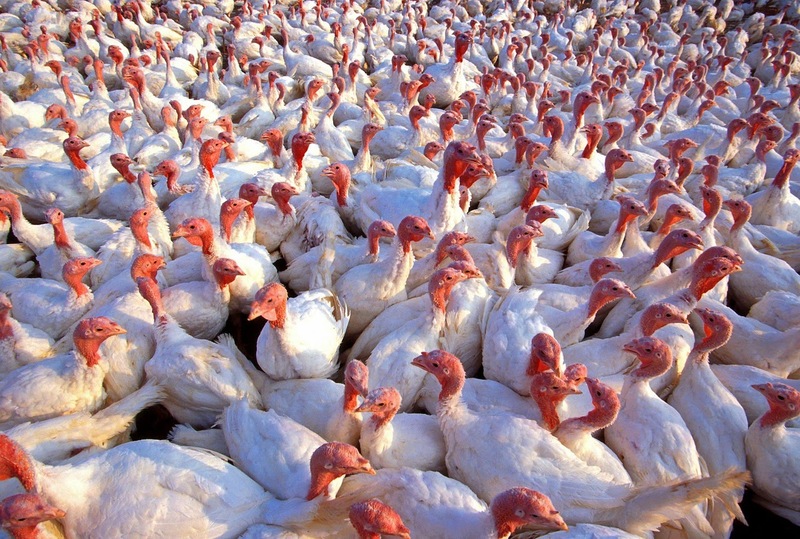 The lifespan of commerically raised turkeys is very short - on average, 126 days. 4. They are bred to have white feathers. Trivia: Since the pin feathers are white, unattractive dark blotches won't mar the surface of the bird's skin after it has been plucked. 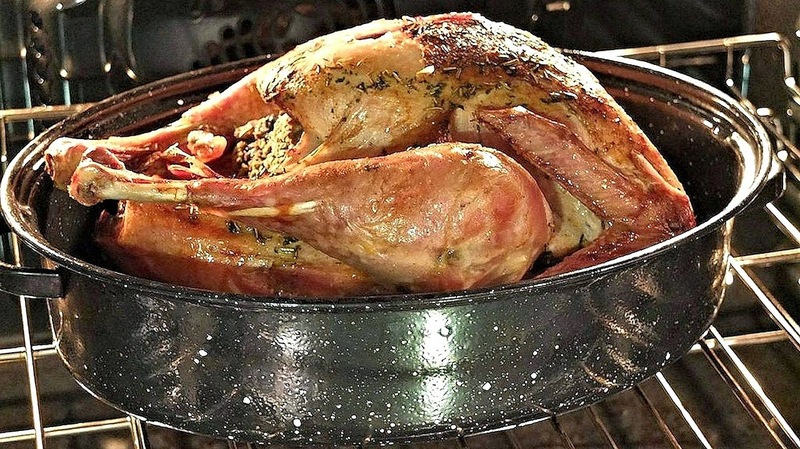 Trivia: The average weight of a Thanksgiving Day turkey is 16 pounds.